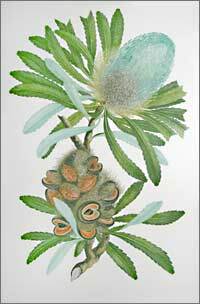 Despite this plague of flies, Sydney Parkinson, Joseph Banks’ botanical artist aboard the HMB Endeavour, managed to complete 269 watercolor paintings and 674 outline drawings of plants before his untimely death aboard ship, in 1771. While Banks, a wealthy and well-connected naturalist with an abundance of ambition, planned to publish a catalogue of the botanical paintings from the Endeavour’s voyage, it never happened in his lifetime. Not until late in the next century were any of Parkinson’s works published, and color versions of his work didn’t appear for more than 200 years after his death. For eleven years after the HMB Endeavour’s return to England from the South Pacific, five artists hired by Banks, the expedition’s naturalist, completed 595 new botanical watercolors based on Parkinson’s unfinished drawings. Working concurrently with the painters was a team of engravers who made copperplate engravings of each painting. By the end of 1784, the artists and engravers had produced a total of 738 works depicting the botanical treasures found by the Endeavour’s naturalists in their travels around the globe. But Banks’ plan for a magnificent 14-volume color catalogue of the Endeavour’s discoveries never materialized. He was elected President of the Royal Society in 1778, and began serving as advisor to King George III to expand and develop the Royal Botanic Gardens, Kew. As demands on his time increased, his plan to publish the paintings fell by the wayside. The copperplate engravings, which were held by the British Museum after Banks’ death, were finally used in the late 19th century to produce some blank-and-white prints for distribution to interested parties. Between 1900 and 1905, a 3-volume compilation of black-and-white prints was published as Illustrations of Australian Plants . But Banks’ plan for a full-color publication of the Endeavour’s botanical paintings wasn’t realized until 1990, when the British Museum (Natural History) and Alecto Historical Editions completed production of Banks’ Florilegium. Key to the project was authenticity—a decision to use only printing technology that would have been available to Banks. In order to use Banks’ original copperplates for this project, the surface of each of the 738 plates had to be polished and resurfaced, as acid in the paper they had been stored in for so many years had pitted the copper. The plates also had not been thoroughly cleaned after those early printing efforts, so dried ink filling all the delicately engraved lines had to be removed in order to produce clear, crisp prints. Colors for the prints were matched to Banks’ original watercolors using the Royal Horticultural Society’s color charts. Once selected, the colored inks were applied directly to the plates by dabbing with a poupée, a small twisted piece of cloth used to fill in all the engraved areas. After inking the 18” x 12” plate, it was passed through the press, and the resulting print was dried between weighted sheets of blotting paper. The copperplate then had to be cleaned again before applying the ink for the next print. When the print was dry, it was checked for accuracy against the original watercolor and Banks’ dried specimens. Lastly, the print was sent to a watercolorist for the addition of fine details. The completed project consisted of 81,180 prints that filled 3,740 Solander boxes. Each complete set of the Banks’ Florilegium consisted of 35 boxes containing 743 prints made from Banks’ original copperplates. Only 100 complete sets were made available for purchase. A complete copy of Banks’ Florilegium sold at Sotheby’s in 2015 for $20,000 and at Christy’s in 2000 for £36,700. For those of us with considerably fewer resources, a selection of 147 of the prints were published in 2017 by Thames and Hudson as Joseph Banks’ Florilegium, Botanical Treasures from Cook’s First Voyage . The prints in the book are 3/4 scale, and the book readily can be found for under $100. The process of printing from the copperplate engravings is far more fascinating than what can be described here. A video from the Rhode Island School of Design demonstrates how the copperplate is engraved, and a video of printing from the engraved plates can be seen here. An abbreviated version of this article appeared in the November 2018 issue of Desert Breeze, the monthly newsletter of the Tucson Cactus and Succulent Society.